I have always adored cherries. When I lived and worked in London I used to love it when the fruit sellers on Tottenham Court Road and outside the tube station started to sell cherries in the summer and I would often buy a pound on the way into the office, a pound at lunch time and maybe another on the way home! Their season seemed absurdly short and over all too soon. When I first moved to Kent just over ten years ago to the home of the cherry I was of course in heaven. There is a seasonal fruit stall that operates in the summer near to our house and Lila, whose stall it is, appears as soon as there are cherries to sell, the date is never the same. When her signs go up it marks a moment of great happiness in our household and we stop by most days for our fix. To my delight the cherry season is in fact wonderfully long as the growers have a multitude of varieties to ensure successional picking from early July well into August, and sometimes bumping into the plums and apples in September. Up to fifteen years ago many of the traditional cherry orchards in Kent were being grubbed up. The old standard trees are beautiful but hard to pick, labour intensive involving as they do perilously tall tapering ladders, some varieties grow to 60ft. But new varieties, grown on dwarf root stock and the demand for local, seasonal produce means new commercial orchards have been replanted and the hillsides close to us in Hernhill take on a strange emerald hue as soon as the fruit have set as the trees are netted against the equally cherry loving starlings. These orchards are mostly for the markets and there is an altogether more romantic place for the domestic shopper that I came across a couple of years ago. To reach it you follow signs on the road between Faversham and Whitstable “cherries next left” “cherries follow track” and if you do then you go back in time. 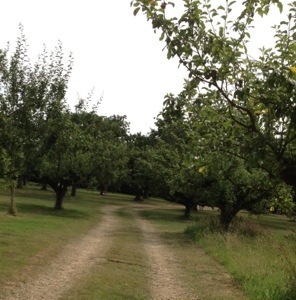 You cut through an ancient Bramley and pear orchard, another rare sight as these vast trees have also become too difficult to grow commercially. The grass track only just visible in places, weaves in and out before emerging into a smallish stand of 30-40 trees, those distinctive tapered ladders peeping out of the top and a sign that says ‘hoot for services’ before finally you come across a brightly painted stall with ‘Terrys Cherries’ proudly written across the top. 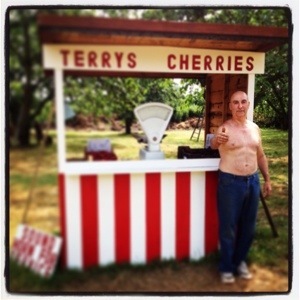 Terry is an ageless man who can get down from the treetops quick smart, who can talk for the county and is generous with his knowledge and his experience. He spends all day every day for the season picking and chatting to his customers, answering questions and recommending the different varieties. He was delighted to find out that we live out on the creek in the middle of the marshes and often tells me tales of his days as a paper boy, riding out to the cottages where we live with an oil lantern on the back of the bike. He remembers the names of all of my children from one season to the next, which delights them too! Much like with asparagus, for the first few days and weeks I like to eat the cherries unfettered, usually straight from the rustling paper bag and if they do make it home they adorn a bowl in the middle of the kitchen table and I grab a handful as I pass. Life can indeed be a bowl of cherries. 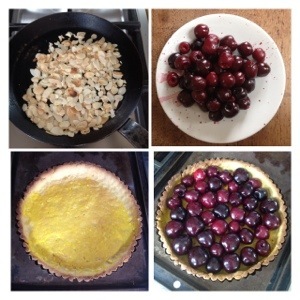 As the season carries on I try try out different dishes, pickles and pies (and this year am determined to make cherry brandy). 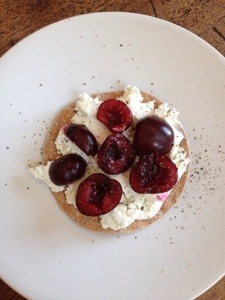 A recent joyful lunchtime discovery was the combination of fresh goat’s curd cheese on a cracker with halved cherries and a grind of black pepper…yum! 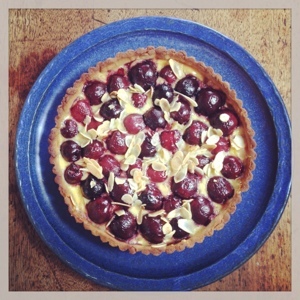 Today it’s going to be a classic cherry tart with crisp sweet pastry and toasted flaked almonds, which I will allow to cool and the custard to set before tucking in with a cup of tea.